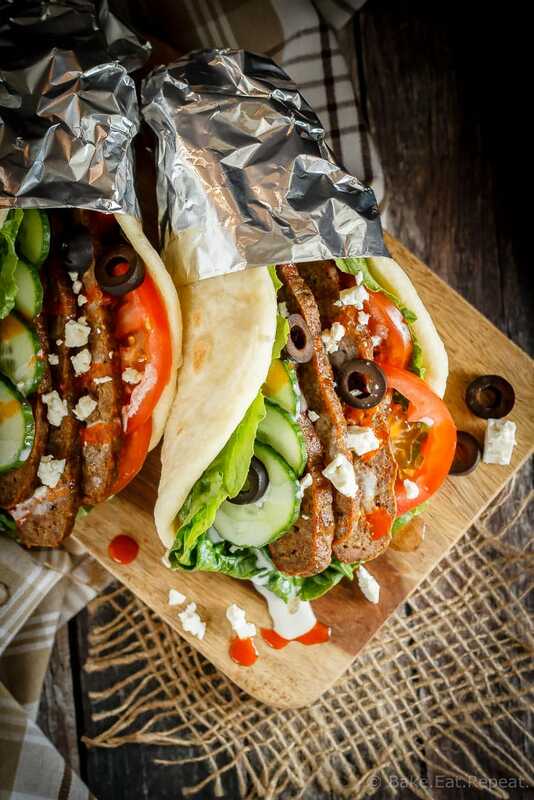 These homemade donairs (gyros) are so easy to make and the whole family will love them! Serve them with flatbread and lots of toppings for a fun and easy meal! When I was 20 years old, I took a year off from university and went to Bible college in Germany for 6 months. I’m not even gonna do the math on how long ago that was now because I don’t want to feel old! But it was a great experience and I loved being able to live in Europe for 6 months. One of the foods I discovered while I was there were donairs, although the Turkish guy at the little corner place that sold them called them donar kebabs (and I’ve also seen them called gyros). Since coming home I’ve learned that you can actually get them at plenty of places here too, but I had never had them before. Those donairs were so, so tasty. I don’t think I’ve ever actually bought one since coming home, but they were one of those things that I really enjoyed while I was in Germany. And this recipe reminds me of those donairs. They’re not exactly the same. I don’t have a giant rotisserie to cook the meat and shave it off. Oddly enough. But for a homemade version, they’re pretty close. 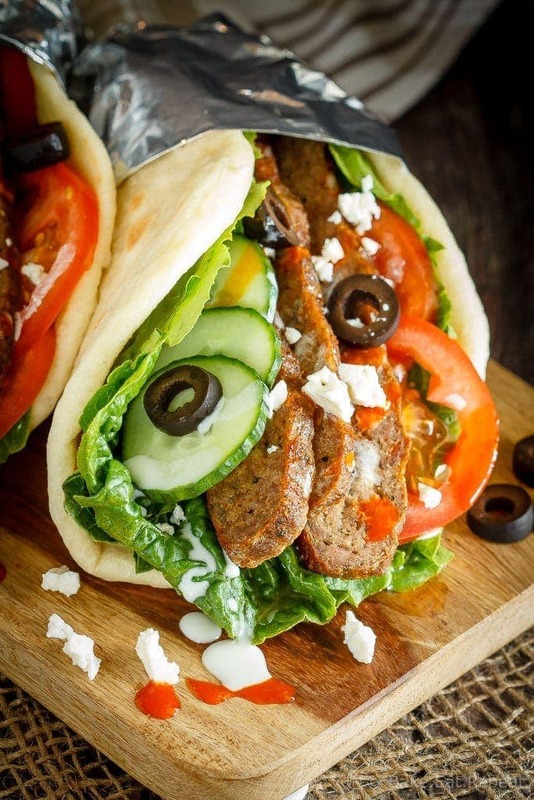 This soft flatbread is perfect with these homemade gyros and it’s pretty similar. The donair sauce is close and the toppings are the same. Now if only I knew what kind of cheese he used, they would be pretty close to perfect. If anyone knows, please enlighten me! I used feta which was good, but not quite the same. Even with the differences though, every time I make these, it reminds me of school in Germany, and buying donar kebabs from the Turkish shop on the corner. Plus the whole family loves these and they’re easy to make so it’s a great dinner recipe! 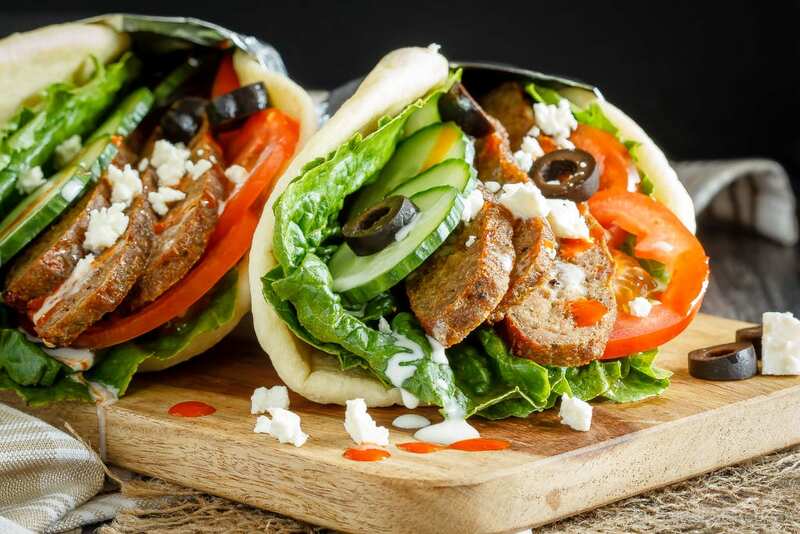 I’ve used different ground meats in these donairs – beef, turkey and lamb – and they’re all delicious so use any combination you like. I have made them all beef too, but we do prefer it with half turkey or chicken instead as it’s leaner, and the combination gives a nice flavour. the toppings are all optional so skip anything you don’t like – the combination of both donair sauce and hot sauce is pretty fantastic so I definitely recommend using both! These homemade donairs are so easy to make and the whole family will love them! Serve them with flatbread and lots of toppings for a fun and easy meal! Combine the ground beef or lamb, ground turkey, flour, parsley, oregano, garlic powder, onion powder, pepper and salt in a large bowl and mash with a potato masher until very well combined. You want it to be a very uniform mixture, much more processed than for something like meatballs. You can even use a food processor if you like, but I usually just mash it well. Dump the meat mixture onto a broiler pan or rimmed cookie sheet, and form it into a long, wide loaf shape, about 1 to 1 1/2 inches tall. Place in the oven and bake for 55 minutes or until cooked through. 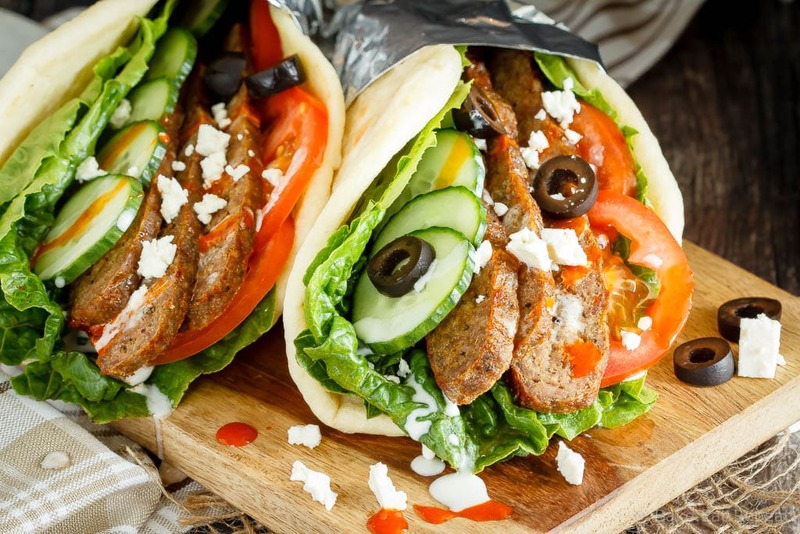 The internal temperature should be 180 degrees F.
While the meat is cooking, whisk together the mayo, milk, vinegar and sugar for the donair sauce and put it in the refrigerator until the meat is ready. Prepare the toppings for the donairs. When the meat is cooked, slice it into thin slices (a long serrated knife works best for this) and serve with the bread, toppings and sauces. This recipe can be easily doubled if you're cooking for more people or just want leftovers for lunch the next day. The meat tastes great cold as well if you have leftovers. Source: Adapted from Eating Forward . Hi Rachel - sorry about that, I updated my recipe card plugin recently and some of the old recipes didn't transfer properly. I've added the links back into the recipe card on this recipe now so it should work for you! Bodenseehof? I was at Capernwray 25 years ago. Small world! Yup, Bodenseehof - 16 years ago! Such a great place! My kids are planning on continuing the tradition when they leave home. Love it!